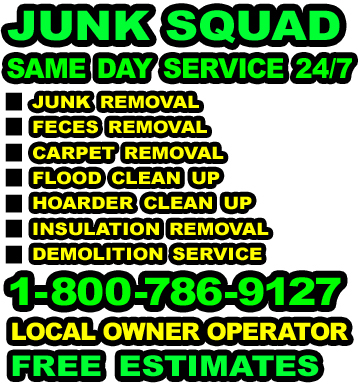 JUNK SQUAD is a 24/7 SAME DAY trash removal company. We offer junk removal service, carpet removal service, insulation removal service, hoarder clean up service, animal feces clean up service, flood clean up service and demolition service. We give FREE ESTIMATES for animal hoarding clean up, clutter clean up, attic clean up, basement clean up, crawlspace clean up, garage clean up, house clean up & building clean up. Our trash removal services include furniture removal, piano removal, safe removal, hot tub removal, shed removal, swing set removal, pool removal, deck removal & fence removal. CALL 1-800-786-9127 ANYTIME! JUNK SQUAD can send a one man army for small trash clean up service or a bus load of techs for a trash hoarding clean up service. No clean up job is too big or too small. Bad weather can not stop us. Dogs do not scare us. Even sewage contaminated trash is of no concern. Call our Clean Up Company at 1-800-786-9127 Anytime for Same Day Clean Up Service! JUNK SQUAD has SAME DAY hoarding clean up service, clutter clean up service, animal feces clean up service, attic clean up service, basement clean up service, crawlspace clean up service & cellar clean up service. Our disaster clean up service includes mud clean up, sewage clean up, sludge clean up, mold clean up, feces clean up, flood clean up & fire clean up. We will clean up anything you have-anywhere you have it-anytime you want! Call our Clean Up Company at 1-800-786-9127 Anytime for Same Day Clean Up Service! JUNK SQUAD offers SAME DAY free estimates on an attic clean out, basement clean out, garage clean out, house clean out, estate clean out, office clean out, building clean out, hoarder clean out, clutter clean out & trash clean out. 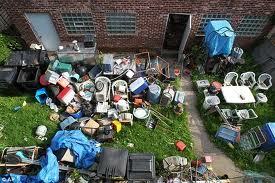 We are prepared to do the junk clean out service on the spot at the time of the free estimate. Call our Clean Out Company at 1-800-786-9127 Anytime for Same Day Clean Out Service! 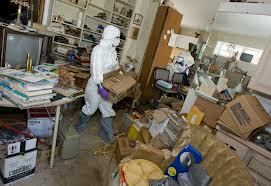 JUNK SQUAD has SAME DAY hoarder clean up service & clutter clean up service. We offer piano removal, office furniture removal, jacuzzi removal, hot tub removal, spa removal, safe removal, sign removal, pool table removal, shed removal, fence removal, porch removal, deck removal, swimming pool removal, playset removal & swingset removal. Our flood removal service includes wet insulation removal, wet ceiling removal, wet drywall removal, wet carpet removal, wet tile floor removal & wet wood floor removal. We are available for any kind of rubbish hoarding clean up, trash hoarding clean up, garbage hoarding clean up, debris hoarding clean up, clutter hoarding clean up & junk hoarding clean up service. Call our Hoarding Clean Up Company at 1-800-786-9127 Anytime for Same Day Hoarding Clean Up Service & Junk Removal Service! JUNK SQUAD specializes in SAME DAY animal feces clean up service and animal feces removal service. We offer raccoon feces clean up, rodent feces clean up, bat feces clean up, bird feces clean up, mouse feces clean up, rat feces clean up, cat feces clean up, dog feces clean up, mice feces clean up, pigeon feces clean up & squirrel feces clean up. 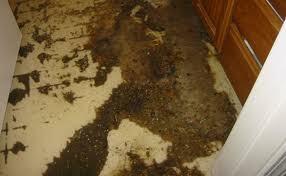 We remove animal feces and clean up animal feces in attics, basements, garages, houses & buildings. Call our Animal Feces Clean Up Company at 1-800-786-9127 Anytime for Same Day Animal Feces Clean Up Service! JUNK SQUAD has SAME DAY clean up service of a fallen tree from a roof after a storm. We offer hurricane damage clean up, tornado damage clean up, strong wind damage clean up, earthquake damage clean up or rain storm damage clean up with 30 Minute Response. We can pump out water from your basement or clean up your flooded building. 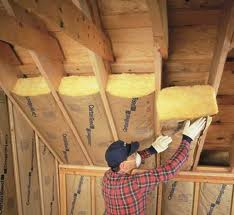 We remove all wet carpet, wet drywall and set up fans & dehumidifiers to dry out the structure. Large disaster clean up services and trash removal services such as these can usually be billed to your insurance company. Call our Disaster Clean Up Company at 1-800-786-9127 Anytime for Same Day Disaster Damage Clean Up Service & Wind Damage Clean Up Service! 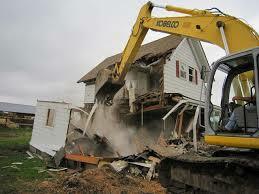 JUNK SQUAD has SAME DAY house demolition service and building demolition service. We can bring down any structure. Garage demolition service, shed demolition service, barn demolition service, residential home demolition service and commercial demolition service are handled by our large project coordinator. We carefully plan out the interior demolition service & exterior demolition service to insure safety and protect nearby structures. We don't only demo houses and demo buildings, we also offer house gut out, wet basement gut out & commercial building gut out services. We do all the construction debris clean up service. 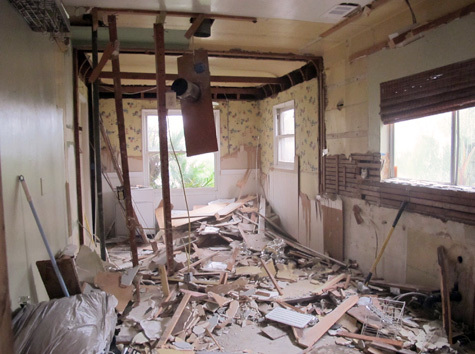 Call our Demolition Company at 1-800-786-9127 Anytime for Same Day Demolition Service & Gut Out Service!